As England tears herself apart in the War of the Roses, Anne de Bohun lives far away from the intrigues of cities and courts. 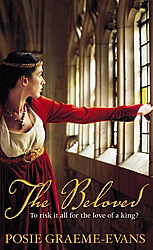 Once King Edward IV’s mistress, Anne has found safety with their son on a small farm in Flanders. Now Edward himself is an exiled fugitive, while Anne’s real father, King Henry VI, rules England again. Summoned by an enigmatic message from her lover, Anne is drawn once more to the passion, the excitement and the deadly danger that Edward Plantagenet brings into her life. But now, the girl who was once a penniless servant has a child and an inheritance to defend. In this dazzling finale to the Anne trilogy, Edward and Anne’s all–consuming passion is reignited and wild forces are let loose in Anne’s life. An old friend and old enemy return — one is rival to Edward and will risk everything to see her happy at last, while the other wants her dead. Can Anne let her love for Edward threaten everything she has? Or will she need his help to protect her from the powerful enemies who mean to destroy her?